Physician dispensed cosmeceuticals are cosmetic products that contain active ingredients to target the clinically visible signs of aging, infection, or other imperfections in one’s personal appearance. The market is expected to expand at a rapid pace, marked by a sea change in market dynamics, with dermatologists, trichologists, and skin care specialists turning into entrepreneurs. Consequently, the market is gradually becoming fragmented due to mushrooming skin and hair clinics and treatment centers, which are startups by physicians who prescribe branded cosmeceuticals products. Some of these physician-turned entrepreneurs also recommend locally manufactured low-cost products developed by their own clinics. Dermatologists claim that there is an increasing tendency of pharmacy benefit managers as well as consumers to reject cosmeceuticals that are not able to produce visible results and are expensive. Therefore, the product should prove its claims to remain competitive in this market. The global physician dispensed cosmeceuticals market was valued at US$ 13,146.80 Mn in 2017. It is expected to expand at a CAGR of 10.3% from 2018 to 2026. The global physician dispensed cosmeceuticals market has been segmented based on product type and region. Furthermore, in terms of product type, the market has been divided into skin care products, hair care products, eye care products, injectable Botox, and others. The skin care products segment accounted for a prominent share of the global physician dispensed cosmeceuticals market in 2017, as the nature of cosmeceuticals demanded by consumers is largely to treat dermatological conditions. Increasing awareness about personal maintenance among the geriatric population and changing attitudes of middle-aged and geriatric population in developing countries have fuelled the demand for cosmeceuticals in order to eliminate the outwardly signs of aging. The anti-aging segment is expected to maintain its dominance in the market during the forecast period. Similarly, dermal fillers and injectable Botox segments are expected to expand considerably from 2018 to 2026. 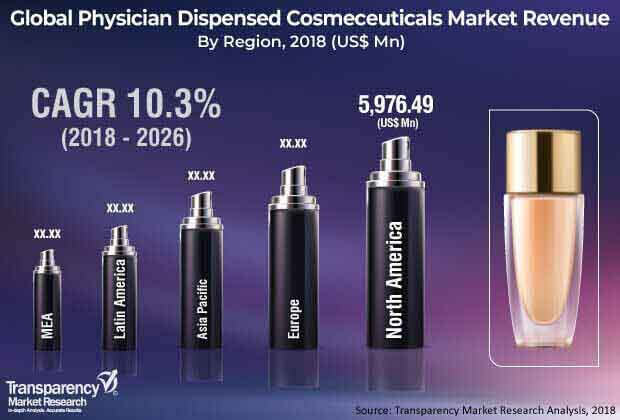 In terms of region, the global physician dispensed cosmeceuticals market has been segmented into North America, Europe, Asia Pacific, Latin America, and Middle East & Africa. North America is mature and technically developed, as compared to the other regions. Hence, the region accounted for a notable share of the global market, in terms of revenue, in 2017. The market in Asia Pacific is anticipated to expand at a rapid pace during the forecast period. Increasing preference to retain beauty and youthful appearance propels the demand for effective cosmeceuticals. These factors are expected to drive the market in this region. Similarly, other emerging markets such as Brazil, South Africa, the UAE, and Saudi Arabia are expected to expand at a steady pace during the forecast period. High revenue generating cosmeceutical products such as injectable Botox and dermal fillers have a minuscule consumer base in underdeveloped and developing regions due to high cost, lack of sufficient knowledge, apprehensions, and lower popularity among end-users. Key players operating in the global physician dispensed cosmeceuticals market include Allergan plc, Jan Marini Skin Research, Inc., Johnson & Johnson, L'Oreal S.A., Procter & Gamble Co., Bausch Health Companies Inc., Unilever plc, and ZO Skin Health Inc., and L'Oreal S.A. These companies have diverse product offerings and extensive distribution systems across the world. Moreover, entry of small players, especially in the emerging markets of Asia, is being witnessed. However, stringent regulatory framework and high-quality standards set by market leaders are anticipated to restrain the penetration of new entrants in the market. This report analyzes the current and future scenario of the global physician cosmeceuticals market. Rising demand for cosmeceuticals, increasing emphasis on beauty and appearance, and rising awareness about anti-aging are major drivers of the global market. The global physician dispensed cosmeceuticals market report comprises an elaborate executive summary, which includes a snapshot that provides information about various segments of the market. It also provides information and data analysis of the global market with respect to segments based on product type and region. A detailed qualitative analysis of drivers and restraints of the market and opportunities has been provided in the overview section. Additionally, the section comprises competitive matrix and company profiles with business overview to understand the competitive landscape in the market. This section of the report also provides market attractiveness analysis by region and market share analysis by key players, thereby presenting a thorough analysis of the overall competitive scenario in the global physician dispensed cosmeceuticals market. The global physician dispensed cosmeceuticals market has been segmented based on product type and region. In terms of product type, the global market has been divided into skin care products, hair care products, eye care products, injectable Botox, and others. The skin care products segment is likely to account for a leading share of the global market during the forecast period owing to an increase in the prevalence of dermatological conditions and increasing awareness about personal appearance among the geriatric population. The market size and forecast for each of these segments have been provided for the period from 2016 to 2026, along with their respective CAGRs for the forecast period from 2018 to 2026, considering 2017 as the base year. In terms of region, the global physician dispensed cosmeceuticals market has been segmented into five major regions and key countries/sub-regions: North America (the U.S. and Canada), Europe (the U.K., Germany, France, Spain, Italy, and Rest of Europe), Asia Pacific (India, China, Japan, Australia & New Zealand, and Rest of Asia Pacific), Latin America (Brazil, Mexico, and Rest of Latin America), and Middle East & Africa (South Africa, GCC Countries, and Rest of Middle East & Africa). The market size and forecast for each of these regions and countries/sub-regions have been provided for the period from 2016 to 2026, along with their respective CAGRs for the forecast period from 2018 to 2026, considering 2017 as the base year. The research study also covers the competitive scenario in these regions. The report also profiles major players in the global physician dispensed cosmeceuticals market based on various attributes such as company overview, financial overview, product portfolio, business strategies, and recent developments. Key players operating in the global physician dispensed cosmeceuticals market are Allergan plc, Jan Marini Skin Research, Inc., Johnson & Johnson, L'Oreal S.A., Procter & Gamble Co., Bausch Health Companies Inc., Unilever plc, and ZO Skin Health Inc..